Hello travel enthusiast! Are you interested in getting greater magnification with a focused and clear field of view? After you looking to get the clearest and crisp view from a telescope monocular, along with durability? Well, you've come to the right place! Our MonoSee compact monocular telescope was designed with our customers in mind. It is the perfect accessory to bring along when hiking, hunting, wildlife, climbing, night vision, bird watching, sports, games and other outdoor adventures. So what are you waiting for? 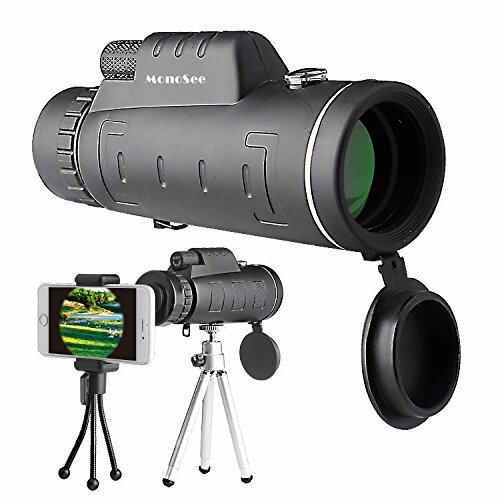 Get this high-quality monocular telescope today! We know our customers are avid adventurers who want to capture perfect pictures every time. That's why we've included everything you need for your next excursion. When you order our monocular telescope, you'll also be getting a lens package, phone photo bracket, adjustable tripod, aluminum tripod, lens cap, lens lanyard, a cleaning cloth to keep your lenses clean, as well as detailed instructions on how to operate your new binocular scope! Are you going on a trip soon? Looking for something that is compact, lightweight, and easy to use? Our compact monocular telescope is easy to carry around and will fit well into any purse or backpack. It comes with 2 convenient tripods, one for the monocular and another one for your phone. Now you can get clear views for photo taking any time. Our powerful monocular telescope has a wide variety of uses and can even be used as a night vision monocular. Perfect for hiking, night hunting camping, wildlife, site seeing. HIGH POWER QUALITY 12X50 BAK4 PRISM LENSES - Why would you settle for anything less than quality lenses on your outdoor and wildlife adventures? Our high definition monocular telescope will give you the distant vision you need when you go hiking, hunting, climbing, camping, bird watching, attending sporting events, city traveling, watching wildlife scenery, and much more! DURABLE ENGINEERING PLASTIC - Our durable monocular is perfect for outdoor use as it is constructed of high durability engineering plastic that will protect it from any small drop! Its tight fitting protection allows it to withstand even the toughest weather conditions. The rubber coating makes it extremely comfortable for long uses and keeps it from slipping out of your hands. CONVENIENT PHONE ATTACHMENT INCLUDED - Looking to take great long distance photos on your smartphone? Our compact monocular telescope for phones comes with a handy phone clip so you can take perfect pictures every time! Cellphone Not included. COMPACT & WATERPROOF DESIGN - Take our compact monocular telescope to the lake, the beach, or any wet season activity and feel safe that it will not be damaged due to the lightweight, waterproof engineering plastic! The compact size makes it great for outdoor traveling and wildlife adventures. Super easy to pack into your backpack. Now you can take perfect pictures every time! ADVENTURE AWAITS - Our HD monocular telescope has many versatile uses. Whether you are going attending a sporting event, bird watching, camping, hunting, traveling in the city, you can be sure to get clear and crisp images with these waterproof monoculars. This user-friendly nature monocular can even be used as night vision monocular. If you have any questions about this product by MonoSee, contact us by completing and submitting the form below. If you are looking for a specif part number, please include it with your message.